For followers of my blog, you know that I have been making my rounds around the most popular and well regarded ramen restaurants around Shinjuku…culminating in my top five ramen in Shinjuku list I published a couple days ago. After having some amazing and sometimes pricey ramen in Shinjuku for the last couple weeks, I decided to give my wallet a break and have the best, most unhealthy, and cheapest ramen available. So for the next week, I’ll be reviewing the Ramen Jiro locations I have visited in the past week. Since this is quite an unhealthy ramen variety, this won’t be a long series and will be back to the Michelin Guide and Tabelog Top 100 restaurants soon enough. 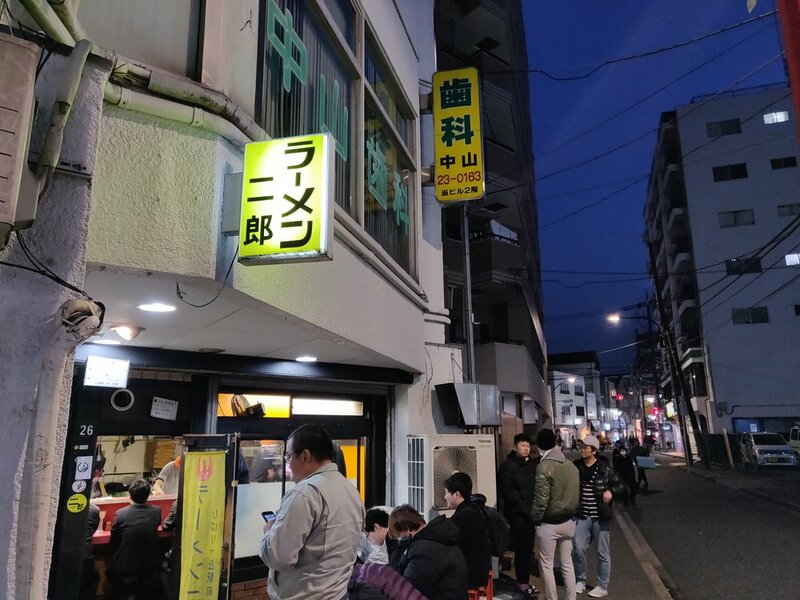 However, while on the subject of Tabelog Top 100, the reason I chose this location, Hibarigaoka, as my first Ramen Jiro of this series is because this shop is actually one of three that are listed on the Tabelog Top 100 list. Hibarigaoka is among the favorites within the Jirorian (Jiro lovers) community and rightfully so. Not only is the owner incredibly friendly, the Jiro ramen here is definitely one of the best I’ve had. It’s hard to imagine Hibarigaoka not making my favorites of 2019 and might even contend for the best Jiro in Tokyo. Hibarigaoka Jiro is located just five minute walk from the Hibarigaoka station on the Seibu Ikebukuro line, about 25 minutes from Shinjuku. Once you arrive, you’ll be greeted with a nice long queue, but since Jiro is a pretty no frill, eat and leave type of shop, the line moves quite quickly. The ticket system at the Hibarigaoka Jiro is a bit different in that you buy your tickets as you enter. You’ll find that Jiro is split between buying when you enter and purchasing before you get in line. I will be sure to check which one each location utilizes from here on out. Anyways, the menu system is quite simple here at the Hibarigaoka location and they don’t have any additional toppings. From left to right you have the Ramen with less noodles at 650 yen, Regular Ramen with two slices of pork char siu at 700 yen, Regular Ramen with four slices of pork char siu at 850 yen, Oolong tea at 100 yen and then the Large Ramen with two slices of pork char siu on the second row at 800 yen, and finally the Large Ramen with four slices of pork char siu at 950 yen. As with all Ramen Jiro locations, the portions are huge. If you don’t have a large appetite, I recommend getting the one with less noodles. Don’t overdo it with the large ramen as most people avoid it and tend not to be able to finish it. Once you have your ramen purchased at the ticket machine, take an open seat and hand the ticket over to the chef behind the counter. When your ramen is ready he’ll ask you “Ninniku wa?”, or “would you like garlic?”. This is the time you can request additional free toppings. Yasai (vegetables consisting of blanched cabbage and bean sprouts), Ninniku (pressed garlic), Abura (pork fat), and Karame (seasoning sauce) are all free of charge and when the chef asks what you’d like, you call out which toppings you would like and how much of each. If you say each each topping, you will get an average amount of those toppings. If you want a little extra of a certain topping, you can say “Mashi” after which ever topping you want more of. “Mashi-Mashi” will be even more of said topping. So for instance, if you wanted no garlic, extra vegetables, and normal pork fat and seasoning sauce, you would say “Yasai mashi, abura, karame”. If you want extra of all the toppings you can say “Zen-Mashi”, or everything extra. I opted to order the Regular Ramen with four slices of pork char siu and asked for “Yasai, Ninniku, Abura” for a bit extra of veggies, garlic and pork fat. Pictured above is my order. While it may not look as big as the other Jiro in the photo, the bowl is actually quite deep and is packed with noodles underneath all of the veggies. The soup at almost all Jiro locations has the basic ingredients of pork bones, pork fat, and a variety of veggies. It’s not simmered as much as a Tonkotsu ramen, so it has the rich flavor of pork, without the creaminess and smell of a Tonkotsu. More specifically, the soup at the Hibarigaoka location is a bit more emulsified than other locations. The term emulsified is used quite often when describing the ramen at Jiro. What this means is whether or not the soup has the oils and broth blended together into one cohesive soup, or more separated within the bowl. 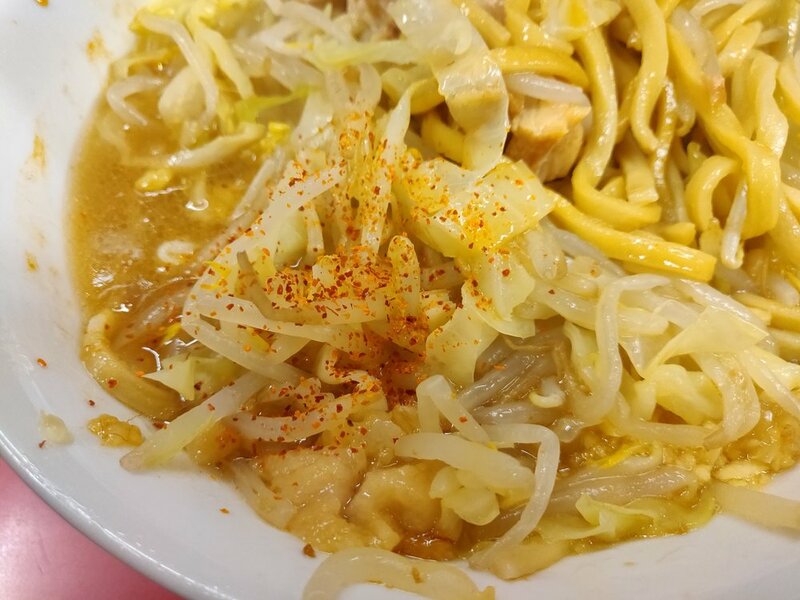 Most Jirorians, or Jiro fanatics, are split between the Hibarigaoka location, Mita headquarter location, and the Hachioji Yaenkaido location as their favorites with it depending mainly on whether or not they prefer a more emulsified soup, or less emulsified soup. I quite like both styles, but the emulsified soup here at Hibarigaoka has an incredibly intense flavor. The sodium content is a bit higher, and the soup is a bit thicker making it a lot more difficult to finish the soup as opposed to the Mita and Hachioji locations. However, because the soup is so intense, the flavors are more enhanced and makes for the perfect pairing with the thick noodles and voluminous amount of veggies. The abura, or pork fat is oily, salty, and melts in your mouth tender. Abura tastes great eating with the veggies, acting like the most unhealthy salad dressing ever. However, as the moysashi bean sprouts and cabbage are just lightly blanched with no added seasoning, it needs the Abura to give it a flavor kick. You can really taste the wheat flour in the noodles at this locations and has a golden hue to them. The color derives from the special water they use, apparently used after having a bit of Japanese herbs soaked in. As it is a shop secret, I’m not quite sure what the herb is, but will add it in if I ever find out. Noodles are a bit on the chewier side here, which I prefer, and holds its shape and texture quite well in the soup. 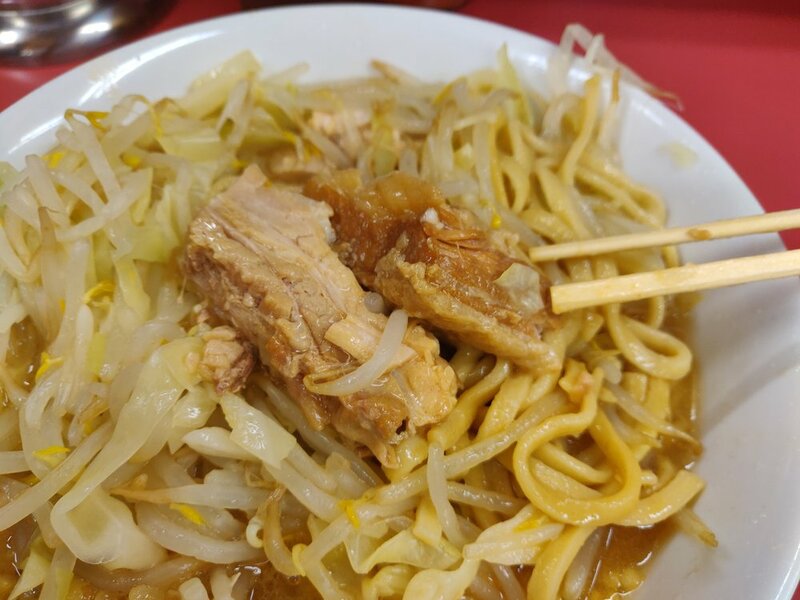 Some Jiro fanatics like the Dero-kei, or almost melting noodles, which are so soft from soaking in the soup that it melts in your mouth, but I love the chewier noodles of the Hibarigaoka location. The char siu is top notch and is so tender it falls apart as you try to pick them up with your chopsticks. The pork used for the char siu is cooked in the same pot as the broth and then marinated in the Tare, or seasoning sauce, of the ramen so it blends together with the bowl perfectly. Since the noodles are thick and chewy, the fall apart char siu was a nice texture change. I typically like a meatier pork char siu at Jiro, but this was a nice change of pace. At the counter, black pepper and chili powder is available for use. For a mid meal, flavor change, try adding a bit of the chili powder for a spicy kick. It’s not terribly spicy, so if you like it to be firey, you’ll need to add a good amount, but I don’t think the ramen tastes as good with the chili powder so I wouldn’t recommend adding too much. If I’m being completely honest, if your plans for eating ramen in Tokyo is checking out the best, top quality ramen you can get, Ramen Jiro is not for you. If you’re looking for high end ingredients and super clean tables, Jiro is not for you. However, if you’re an enthusiasts looking for what locals eat, and has a huge part of cultural significance to ramen history, I definitely recommend going to a couple Jiro locations. Hibarigaoka is far and away one of the top three in Japan (out of the 39 total locations) so even out of the entire franchise, this is most highly regarded. While it can be a bit scary and intimidating, the master is the nicest of all the locations I’ve been to and will likely be the most pleasant experience for you. With that said, as always, let me know what you thought of the ramen via Facebook, instagram, twitter, and/or the comment section below. Hope you enjoy yourself a nice bowl of Jiro soon!